After a wild off-season (Realmuto, McCutchen, Segura, Robertson) and the very long wait for Bryce’s (wise) decision, spring is upon us in Philadelphia, and that means sunshine, warmer weather, Phillies baseball and ice cold brews. Which particular beer? Where is it located? Fear not, Phillies/beer fans, we got you covered. 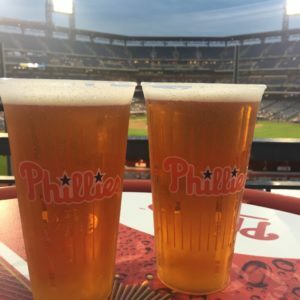 Welcome to our 8th Annual CBP Phillies beer locator! McFadden’s is gone! Maybe a little rowdy for some fans and families, but I’ll miss McFadden’s. Lots of memories there — Phillies games, concerts, beers after the Broad Street Run and various 5k’s, etc. Heck, one of my buddies even met his now-wife there. Thank you, McFadden’s. The original giant Liberty Bell from Veterans Stadium has returned and will now greet fans as they enter the third base gates. Pass & Stow is the main restaurant in the former McFadden’s area with full-service seating/tables. It’s named after John Pass and John Stow, who recast the Liberty Bell in 1753 in Philadelphia. Their names are inscribed on the Bell, as well. Outside of Pass & Stow is a multi-venue beer garden with direct access to the field. There are fire pits, high top tables, etc., and you can expect live music before/after select games, as well. There’s also a four-sided bar exclusively pouring Goose Island beers. In this giant area, there’s also a new Shake Shack — the largest in the country from what a source tells me — with plenty of tables. The entire Pass & Stow area will serve alcohol well until after the game ends. So this becomes another loophole (like the HOF and Diamond Club) where you can keep drinking well pass the 7th inning cutoff. I can’t wait to be at an extra innings game and be able to grab a beverage from this centrally located area by home plate. Unlike McFadden’s, you’ll need a game ticket to hangout at Pass & Stow, and except for big Eagles, Sixers and Flyers games and for major concerts, there’s no plans for it to be open except during Phillies home games. The good news is regarding that is that there will no longer be long lines to get your game ticket activated/deactivated as you enter or leave this area. This area is wide open to come and g0 as you please. Very cool. You can get closer to the action now in two areas where there are plenty of new high top tables with great views in left field and center field. The monster modern bar along the concourse in the right field corner is back for its second year. A lot more full-service bars with wine and booze scattered around the ballpark. Even more places to charge your cellphone (while you drink and watch baseball), too! Like the last few years, you’re going to see mega cans, 16-ounce and 19.2-ounce craft cans everywhere and anywhere in 2019. And also like the last few years, you’ll see less diversity and more and more Anheuser-Busch products — be those traditional Bud brands or their premium/craft brands that AB owns (like Goose Island and Golden Road). That said, there are a lot of changes to the beer lineup this year, so get ready to crush some new suds. Craft bottles are nonexistent again this year. Only domestic plastic bottles. I’ve deleted that bottles column from the CBP Brew Locator. Bullpen Session Ale is brewed exclusively for CBP and is only available at the ballpark. It’s brewed at the Goose Island Pub in Fishtown. This is a New England Style Session IPA, brewed with generous amounts of oats. It has a slightly hazy appearance with a medium body. Late-hop and dry-hop additions of Azacca, El Dorado & Centennial, and I’m told it has intense aromas of pineapple & mango. Other new craft beers on draft this season include: Conshohocken Puddlers Row ESB (wasn’t here last year), Flying Fish Outside IPA, Founders Centennial IPA, Golden Road Mango Cart, Goose Island Next Coast IPA, Goose Island Summertime Kolsch, New Belgium Juicy Haze, Troegs Boysenberry Tart Ale, Victory No Brainer IPA, and Victory Twisted Monkey. New craft cans this season include: Conshohocken Blood Money, Conshohocken Philly Vice, Flying Fish Salt & Sea, Golden Road Mango Cart, Goose Island Natural Villain, Victory Cloud Walker, and Victory Liberty Bell Ringer. For local beer, you’re only going to find: Conshohocken, Flying Fish, Troegs, Victory, and Yards. Similar to last year, that’s a much smaller field than we used to see. No more Victory Hop Devil at CBP. That was the beer I drank at every home playoff game in 2008. It’s cool how certain beers can add to your memories. We’ll miss you, Hop Devil. You’ll be able to find various ciders pretty much everywhere, and there’s a major gluten-free area by home plate on the main concourse. Bon & Viv spiked seltzer cans are featured throughout the ballpark this year again, too. Two flavors this year: Black Cherry and Grapefruit. And yes indeed, as mentioned before, there will be booze prevalently available throughout the ballpark now. You’ll be able to sip wine and mixed drinks and bring your beverage to your seat! And yes, they’ll pour doubles, too! In the end, beer is a personal choice. Our annual CBP Beer Locator hopes to facilitate your baseball-beverage enjoyment. We hope you enjoy our hard work and enjoy whatever beer is your personal favorite. We’ll be updating all season long. Here’s to a great 2019 Phillies season! High Hopes!